Some say they are the Band Who Refused to Die. Some Say “Haven’t a clue mate”. Others, if challenged, may venture that ACCRINGTON STANLEY ARE A POPULAR INDIE/ROCK BAND FROM THE SOUTH COAST OF THE UK who have achieved something approaching, at a charmingly cautious distance, the status of “Cult National Treasure”. Partly this is down to their continued struggle to make real music, played in front of real people, in what we fear may be increasingly unreal times. Alternatively it may boil down to a knack for catchy songs with intelligent lyrics played with – and here we apologise in advance in case we upset the delicate balance of their diffident Englishness – passion, verve, chutzpah, fiat, oomph, con brio al forno con funghi, or if you like, as if they bloody well mean it. 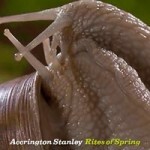 Those new to ACCRINGTON STANLEY from recent gigs, their terrifying recent media saturation, or by way of their latest EP “Rites of Spring” may be surprised to find a band with a rich history. The band formed in Southampton in 1986, the teenage creation of singer/songwriter/guitarist DAN O’FARRELL and keyboardist RICHARD BARRETT. Immediately playing gigs in their home town, they became significant players in the vibrant South Coast music scene of the time. Selling short runs of home-produced cassette albums, they typified the have-a-go attitude of the resolutely anti-fashion and anti-showbiz UK post-punk era; Their self-financed album “Giddyblueperfection” (1988) was, for a quartet of wet-behind-the-ears school-leavers, a statement of mature songwriting and audacious musical ambition. Continuing the home-grown work ethic with “Half Life” (1996), the band moved from the indie/Britpop club scene into touring the pubs nationwide, eventually moving out of London in 2004 to record “Uplift” and reconnecting with their Southampton roots. This has led to more recent activity as part of the SOFA CITY BANDS COLLECTIVE. 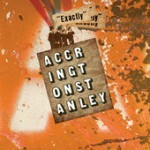 In 2012 renewed interest in the John Peel Archive and an increase in gig activity has seen ACCRINGTON STANLEY on BBC South Today, BBC Radio Solent, Voice FM, as well as numerous live posts on YouTube. To celebrate this, the band re-issued their 1993 album “Lovebound” online; and set about completing their latest album, “Exactly“, released in November 2012.